Dernièrement les mariages vintage sont hyper tendence, et je vous avoue, j'adore cela! Si je pouvais refaire mon mariage je le ferais ainsi, car je trouve cela super sympa et esthétiquement très beau! Biensûr, un point important, sinon le plus important, d'un mariage vintage est la tenue des mariés, plus spécifiquement la robe de mariée. Aujourd'hui je vous présente Alessparis, une boutique en ligne où trouver une robe de mariage sans se ruiner. Lately vintage weddings are super trendy, and I confess, I love it! If I could redo my wedding I would do it in this style, because I find it cool and aesthetically beautiful! Of course, the central subject of a vintage wedding is the wedding dress. Today, I'd like to introduce you to Alessparis an online shop where to find a wedding dress without breaking the bank. Hello, sweeties! happy hump-day! Bonjour tout le monde! I like my blog being my hobby, and I like to make it varied. I try to post about a little bit of makeup, a bit of skincare, nail art and nail polish swatches. However I've noticed lately my nail polish swatches have been purely on press samples, not polishes I've actually chosen myself. Don't get me wrong, most of them are truly beautiful, and I'm more than grateful to have added them to my collection and to have tried nail art with those. But I still want to include some swatches of my most beloved nail colours which I've bought myself. I'll try to do so more often. So, today, I have one of my favorite indie polish to show you, it is one with a strange name but a very lovely and unique one! I have (finally!) decided to dip my toe in the vast ocean of Korean beauty, but I confess the thing overwhelms me a little. There are so many brands and products that it is difficult to know where to start. I suspect I might not be the only one in this situation, so I sketched this new section in my blog, where I would share my impressions as I try and test different Korean products. Ready to kick off a wonderful week? So let's get started bRIGHT, because today's prompt for the Monday Shadow Challenge is RED. Gosh, red eyeshadow?! It sounded scary but ended up being quite fun. Take a look. Hello, hello, sweeties! How are you doing with this beautiful weather?! Happy Friday sweeties! Any nice plans for the weekend? But first, let's take a look at the manicure I have for you today! It's time for the 36th appointment of the 40 Great nail art ideas challenge, and today's prompt is "coral + white", so perfect for summer! About a month ago I posted about some samples of products I've been trying. As I'm curious and forever looking for the perfect products for me, I have a fresh bunch of samples I've been trying lately and I thought to share my first impressions with you again. Shall we? It's time to present you an amazing nail polish collection from the brand Cuccio Colour, The Out of this World Collection, inspired by outer space theme. Such an amazing collection for the nailistas! Absolutely all the shades have an interesting and unique twist. Keep reading to see what I mean. Earlier today was the summer solstice and officially the end of spring and beginning of summer♥♥♥ !!! As promised, I'm publishing a round-up of this second part of my personal Pan Project called "Season's makeup challenge". Keep reading after the jump to find out how well I did using up makeup this spring. Hello Sweeties! Bonjour mes cocottes! 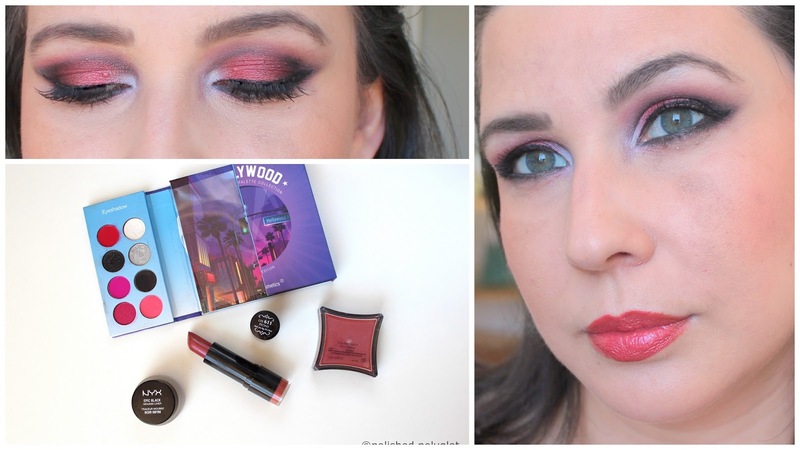 Monday morning has become my favorite day of the week (blogging wise), and that is because I'm taking part in the awesome makeup challenge called Monday Shadow Challenge! Today's prompt is "taupe" and I failed miserably trying to give my look an interesting twist and end up with...well, you'll see. Ready for Panda eyes? Hi there, sweeties! How are you? Bonjour! Comment ça va les poulettes? As you know, on Tuesday 14th Jun my Dermovia Giveaway ended, and I have randomly drawn the names of the winners. Keep reading to find out who were the lucky ladies! If you are also sad because it is almost the weekend and it is almost summer and the weather doesn't seem to have noticed (please Mr. Weather, can you please acknowledge we are actually in SUMMER here? thank you), the participants of the 40 Great nail Art ideas Challenge are here to cheer you up with lots of manicures inspired by summer! Assister à un bal, un gala ou une soirée ou événement important, c’est quelque chose que je fais rarement mais quand j’ai l’occasion je prends un plaisir fou à choisir ma tenue. Le glamour, l'élégance d'une tenue de soirée, j’adore cela, mais côté porte-monnaie ce n'est pas toujours donné. A ce propos, je voulais partager avec vous ma récente découverte de la boutique Miaparis, où l'on peut trouver une robe de soirée pas cher parmi une séléction des robes les unes plus magnifiques que les autres! Attending a bal, a gala or a cocktail party happens very rarely to me. But whenever I have the chance I take a blast choosing my outfit. I love glamourous and elegant cocktail dresses, but my wallet does not always agree. That is why today I want to share with you my recent discovery of Miaparis, an online store where you can find the dress of your dreams at a very reasonable price! How are you today? 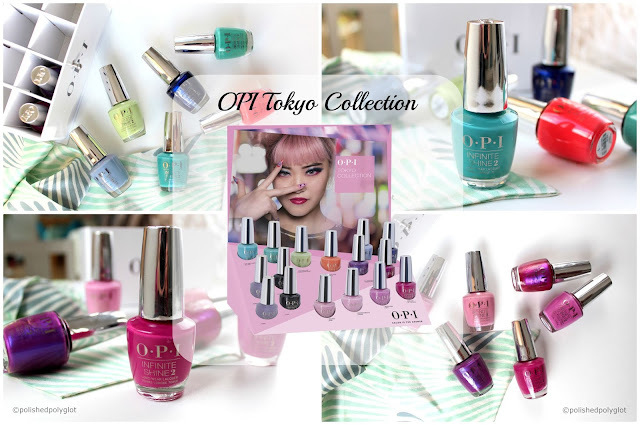 We are having an awful weather in Switzerland :(, but I have a nice surprise for you: a full collection of pretty polishes to cheer you up. Some really feminine, wearable and flattering colours to show you and the best news is at the very bottom of this post, you can win 4x Zoya Petals Collection Lips & tips sets! Hello Sweeties! Bonjour les poulettes! 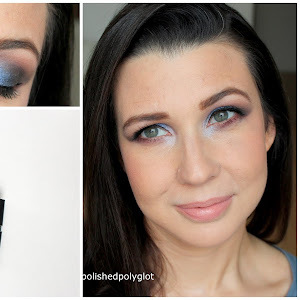 It's the third time in a row that I'm happy it is Monday, and that is because I'm taking part in the awesome makeup challenge called Monday Shadow Challenge! Today's prompt is "plum", and here you are what I came up with. We arrive at the 36th appointment of the 40 Great nail art ideas challenge, and today's prompt is "mint", such a lovely shade for summer! I love jewellery, and have a few expensive pieces... that I NEVER wear!! I'm always afraid to lose them or ruin them (I have two small children always hanging from some part of my body). So I end up opting for affordable stuff. Yes, aaaaall the way! I can wear it daily without fear of bumping it, damaging it (yes, I'm also clumsy...) or losing it, because I know I can always replace it. You can hardly find jewelry that is more affordable than at Born Pretty Store, and with such cute designs as the Olive branch adjustable ring like the one I got! I have been trying to create makeup looks with all of my chosen pieces for the Season's Makeup Challenge. I've challenged myself to finish up a certain number of makeup items by the end of Spring. This little sweet lipgloss is a part of the challenge and the chosen lippy of the week! There are two kinds of shops were I could definitely wander for hours and get lost in every detail: a makeup store and a stationary. There is one particular item I am addicted to fond of: notebooks! Small notebooks, pocket size, cute notepads and mini diaries, they seem to all want to come home with me whenever I visit a stationary shop. When I discovered Born Pretty Store also carried cute stationary items, I couldn't resist and finally got this cute Mini Smiley Diary. Hello Sweeties! Bonjour mes cocottes ! Here is a nice way to start looking forward to Monday mornings! 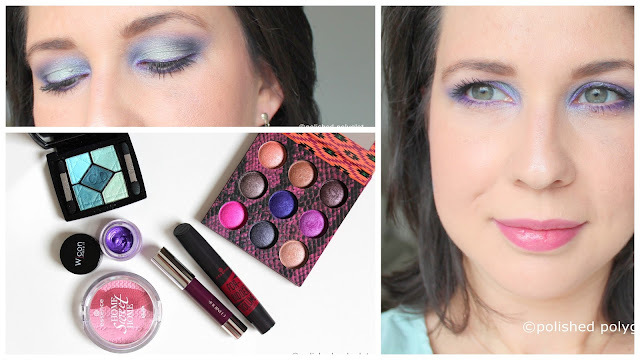 Of course, I'm talking about the awesome makeup challenge called Monday Shadow Challenge! Today's prompt is light green, and here is what I came up with. Hi there sweeties! How are you? Bonjour! Comment ça va les poulettes? I hope you are all having a great Sunday! Here in Switzerland, it is Father's day today, I don't know exactly how people celebrate this around here, because at home we celebrate on March 19th (Italian Father's day) and on 19th June (Argentine Father's day). Anyway, my hubby went to the movies with our eldest and I'm at home with the little one, she's exceptionally quite today, so I take this chance to write in here. Happy Saturday sweeties! How have you spent the day? For the past few weeks, I've been late for the appointment with the 40 Great nail art ideas Challenge. The very simple reason is I am very busy lately, and by the time I reach Friday, I am so tired I can't stay up late for writing (that's when I prepare my posts while everybody else sleeps). So I thought, instead of fighting my own exhausted self, I would let it flow, try to have my well deserve rest, and post when I can. I hope you bear with me! This week we are doing our manicures with a MUST for the season: "Wedding" inspired nail art! I'm here to show you a great collection from the brand Cuccio Colour, this time,inspired by the colours of high seas, because this is The Cruise Colour Collection. I was already very impressed by the first polishes I tried from this brand (read my review about the Royale collection here), the bar was set up high but I wasn't disappointed! Keep reading to see what I mean. Hello, lovelies! Happy hump day! I'm here to chat a little about nail art with you. I know I haven't posted a nail art in about 10 days! But that is about to change because I have received this little all-clear stamper with a cap from Born Pretty Store, and I can't stop creating stamping nail art!